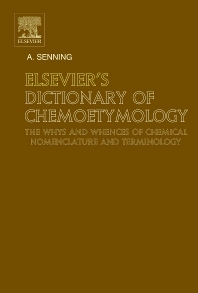 Noting a marked lack of comprehensiveness and/or contemporaneity among typical reference works on chemical etymology, as well as a somewhat spotty coverage of chemical terms and their etymology in comprehensive dictionaries and textbooks the author decided to write an up-to-date desk reference on chemical etymology which would satisfy the needs of casual readers as well as those of more demanding users of etymological lore. Characteristic user-friendly features of the present work include avoidance of cumbersome abbreviations, avoidance of entries in foreign alphabets, and a broad coverage of all chemical disciplines including mineralogy. Biological, medical, geological, physical and mathematical terms are only considered where they appear of interest to mainstream chemists. This book does not provide definitions of terms (unless required in the etymological context) nor guidance as to the timeliness of different nomenclature systems. The typical user will from the outset be well aware of the exact meaning of the terms he or she focuses on and only require the etymological background to be used. Examples of sources which have been drawn upon in the preparation of this book, apart from the extremely useful Internet resource Google, are listed, but an exhausting enumeration would be tiresome and impractical..